How to be an affiliate without a website is our today’s topic in answer to the request of many of my readers. So here it is, at last. I hope that you will enjoy it and that you will benefit from this article. If you have any questions or would like to share your experience, please feel free to do so at the bottom of this page, in the comments section. Well today, there are thousands of affiliate programs out there, including the one I am affiliated to, which I highly recommend if you really want to make money online: Wealthy Affiliate. I’m going to give you here seven techniques that will allow you to publish your links from any type of affiliation, no matter what programs, that will allow you to make money without having a single website. We will start immediately with the first technique. The seven techniques are classified from the most complicated to the easiest. Knowing that the most complicated are also performing the best and the easiest are, of course, the worst performers. So, we start right away with the most powerful and the most difficult. Creating paid advertising is a little more for professionals, people who know a little bit more. Facebook advertising, AdWords advertising, YouTube advertising, Twitter advertising, Instagram, all these are means of communication that allow you to not have websites, but to earn money as an affiliate marketer. When to pay for advertising to promote your affiliate programs? In fact, it is very simple. You must already have some “affiliation experience”. Let’s say you know that when 1,000 people click on your link, you earn for example $50. Well, you know that in CPC or cost per click, for 1,000, you have to invest less than $50 to make money. It’s that simple. But first you need to know this famous phrase: “I earn money and I can invest so much to earn more” ratio. So that was the first technique that is the most complex, but also the most powerful. Indeed, once you understand that, you can invest heavily to gain much greater incomes. My second technique is to share on social media. This can be an excellent idea, or a useless technique, unless you do it properly. In any case, it is very effective in the short term. So why is it that I do not think it’s a good idea? Of course, I myself know people who make living through social networks, by sharing affiliate links. But in my opinion, this is not at all the best technique, even if it works. So, how to use it correctly? Let’s suppose that you post a link on Facebook, on Twitter, on Instagram, regardless of the social network in question, what will happen is that you will publish your link and of course, if there is other people who post their affiliate programs, your advertisement with your affiliate link will get lost in the crowd. So, there is no longer any passive income. There, we are really on an income that are punctual. That is, your earning is dependent on the links you publish. Concretely, it’s as if you were a little employee, you work for others. While if your affiliate programs are shared, if your links are shared on other platforms, (the other five that I will quote here), it will be a much more passive income. This e-book contains my affiliate links inside. It basically means that I give away this e-book and people who have downloaded it for free, if one day they click on an affiliate link inside, well, I might earn some money. It’s that simple. But it even gets better than that, if for instance you have downloaded it, and give it away to someone else, my affiliate link is still inside, therefore I will still earn my affiliate commission if someone joins the affiliate program or buys anything linked to it. Imagine that I give away 10 of those e-books to different people, and in turn, they give it away to 10 other people, you can see how far it can go, right? So, in the same way, what I recommend is to create an e-book. But of course, it’s a time-consuming technique, but it’s very effective. You create an e-book on a particular topic, you put affiliate links in it. For example, yours could be on any affiliate program. And you earn money every time someone reads your e-book and clicks on the affiliate link (and joins or makes a purchase, of course). It’s that simple. And e-books have an advantage is that when they are free, they are viral. They share very quickly. Now, to tell you the truth, you don’t need to write and e-book yourself, you don’t even have to hire the services of a freelance writer/publisher, no need! 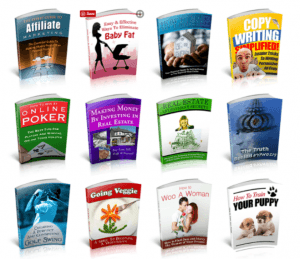 All you have to do is join some affiliate programs that will give you their e-books for you to distribute for FREE. How are we doing so far? Depending how much experience you have with affiliate marketing, you might find these first three techniques more or less difficult. If one of them appeals to you and would like to use it but need a bit of help to get it going, just ask your questions in the comments section at the bottom of this page. Also, if you know how to be an affiliate without a website and you have a technique that works well for you, we would like to hear from you. My fourth, powerful yet time consuming technique is to publish your own YouTube videos. 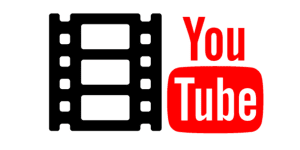 If you do not have websites, maybe you can quickly create YouTube videos. For example, some of the people who joined my affiliate program are YouTube SEO experts. They simply created YouTube videos and they tried to position themselves above me in the search engines: on YouTube, on Google, etc. And they put an affiliate link to their programs. So they make money just by creating videos and including links. You can also put affiliate links in the description of the video. It’s that simple. People watch your videos via YouTube or via your blog, no matter and fall directly on your affiliate link and there you earn money. So that is a technique that, again, takes a little bit of time, but is very effective and passive in the long run. The fifth technique, in my opinion, is one of the most effective, it is to publish on the forums. I will explain this to you, very simply. I learned that from an American marketer called Tai Lopez. In fact, what happens is that as soon as someone registers in his business, automatically, it will create an account on his forum. Then there is someone from the Tai Lopez team who will answer all the needs of the new registrant in question and put a link at the end. You are going to tell me that it takes time and why not simply communicate by e-mail, since in the end, in a forum, if we answer all the time to each question from the people who register on the forum, it is a bit the same as if you answered by e-mail. But in fact, where we are all forgetting, is that the links on the forums will bring SEO traffic. That is to say, there will be free visitors who will come for years, thanks to the keywords that will be typed by people with needs. I’ll take an example, because it may be a little fuzzy. Let’s say that I’m signing up on a blog. Automatically, the blog will send me an e-mail saying: “Tell us exactly what you want; tell us what you want us to help you with by clicking on the link here”. Me, I click on the link, I arrive on a forum, I describe my needs, I tell my story, I explain my situation. The next day, there is someone from the team of the blogger in question who will answer to my question and who will automatically put a link at the end. Let’s say that one day, someone type the same question that I put on the forum, instantly, this person will arrive on the forum in question and he will land on the link. It is almost the customer who worked for the company. It’s completely crazy and I find it really very effective. Remember the forums, it was the fifth technique. My sixth technique, and here we come in my opinion, in techniques that are becoming easier, but are really less effective than the ones I mentioned before. So the sixth technique is going to be putting links, your links, in the comments of the YouTube videos of others. Be very careful about that. Already, what I recommend, if you want to share your affiliate links on YouTube, is not to do it directly in a new comment, but to respond to the comment of someone who has already made a comment. On YouTube, we can post a new comment or we can respond to an existing comment by clicking on “reply”. What I advise you is that as soon as you see a question that is in the comments of a YouTube video, you help the person and only then, you put your link. Above all, answer in a personalized way and put your link in an intelligent way. Do not just say, “Click here, there’s something wonderful, you’ll see it’s going to be completely magical”. Be very careful about this because you may be flagged as a spammer. So really pay attention to that. But if it’s done intelligently, if you answer in “one-to-one”, that is to say in a personalized way to the comments on YouTube, you have very high chances to have some “automatic income”. Indeed, all the following people who will see the video in question, will see your comments. There is a very good chance that they will click on your affiliate link since they will see that you have helped someone in a really personal way and therefore, they will say “why not me?“. It’s very simple, it’s the link that will allow you to make money. This is a link we get by registering on affiliate platforms. What is a guest article? A guest article is the fact that you are writing on a blog that does not belong to you. What does it mean ? Let’s say you’re passionate about cars. What will happen is that you may already know a lot of auto blogs. You can tell the owner of the auto blog: “Hi Brian, can I publish an article on your auto blog? In exchange, I will just put a link to an affiliate program”. The advantage is that the owner of the blog in question will win because inevitably there will be traffic that will arrive on his blog thanks to your article. And the person who wrote the article on the other person’s blog will earn money every time someone clicks on the link in question. So, it’s a win-win situation. It really makes it possible for everyone to have a good long-term stable relationship. And also, to create a business that earns revenue in liabilities through affiliation. Now it can become even better than that, and easier, and even very profitable. You may not be able to write engaging and high quality articles; it is not a skill that everyone has. So why not leave it to the experts and let them do it for you. All you will have to do is send them one or two of your affiliate links for them to include into the content of their next blog post. How about that for an easy, permanent, and long term opportunity to earn a residual income. Where to find that kind of opportunity? On Fiverr. For those who have not heard of Fiverr yet, it is the largest community of freelancers in the world. As its name indicates, you can hire a freelancer’s services for only $5 upward. If you are not a member yet, you can join. It is totally free, then you can hire the services of highly skilled professionals. 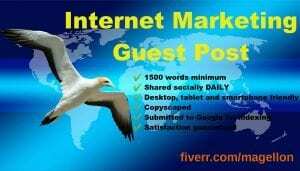 To come back to our guest blogging, I have been hiring my services on Fiverr since 2011. I hope that you enjoyed reading this article as much as I enjoyed writing it; sharing a bit of my affiliate marketing experience with you. As you have read this far, I want to thank you in my own way. I normally don’t share what I am going to share with you as the less people know about it, the better. I know that it is a bit selfish, but we all have to preserve our interests to survive on the Internet, and the more people know exactly how to be an affiliate without a website, the less our share of the profit will be. After reading this article, you should know how to be an affiliate without a website. If you have any tips on the subject we would love to hear from you. And, if you have any questions, please use the box below and I will respond as soon as possible. If you enjoyed this article please share it socially and leave a comment below, I will highly appreciate it! This was a really interesting article but i do believe that having a website is the best way to go. My social media presence is not that big yet so i wouldnt really benefit from posting affiliate links on there. 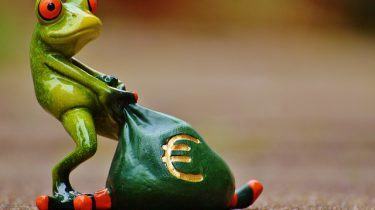 It would be a lot harder to bring in passive income without a website. Social media marketing can be useful for those who find it difficult to build their own websites, although, there is an excellent training program called Wealthy Affiliate which is free to join where anyone can learn how to create a website and to monetize it. I look forward to seeing you here again soon Justin, and if you have not done so yet, I invite your to signup for my newsletter so that you will be notified the minute a new article is posted, and there are some very exciting ones coming up soon. Hi, the structure of the article ”how to be an affiliate without a website” is great. Also, the pictures, hyperlinks and various tools are used broadly to make this on-line article function well as a whole to ask new starters to join the Wealthy Affiliate programme. But, the topics and the bullet points in the WA campaign need to be more specified, clear and condensed as a whole picture. Thanks for visiting my website and for commenting. I do take my readers suggestions into consideration and will look into your input as soon as possible.